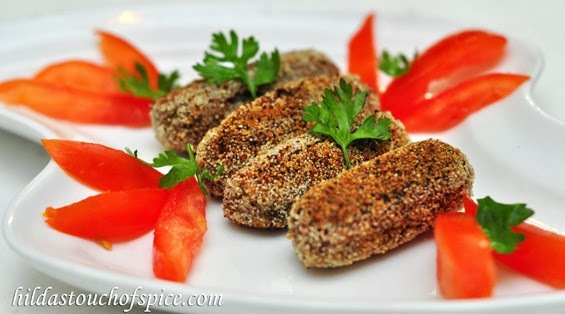 Lightly spiced beef croquettes are the most popular and well loved Goan snack or appetizer. Almost every Goan relishes and enjoys it at all occasions. Beef croquettes are an essential part of Goan cuisine and served at Christmas, Easter, New Year, weddings, parties, birthdays and all celebratory occasions. Besides, it is also a part of everyday meals. Any feast celebration and Sunday meals are incomplete without it. In Goa, authentic Goan restaurants, small eateries and bakeries take great pride in serving these quick finger eats. Goan Beef Mince Croquettes are so simple and quick to make. They are delicious as a light work lunch, they taste good in rolls, burgers and sandwiches. It is a good option as a picnic lunch too. They taste fabulous with Goan Fenny and with cocktails. Be it breakfast, brunch, lunch, snack or dinner…These croquettes make a perfect soul satisfying meal along with fries and a salad. Are you hungry but too tired to fix an elaborate meal? Does your child feel hungry too often but is fed up of the routine? Make a large batch and freeze. You will be amazed how handy they are when you have unexpected guests. Your guests will be delighted with this treat and your hungry, impatient child will be pleased. 1 tsp. Garam Masala pwd. or 1/3 tsp. each of Pepper, Cinnamon, Clove & Jeera pwd. Combine beef mince, onions, ginger, garlic, green chillies, turmeric pwd., a little salt and ¼ cup of water in a pot or pressure cook up to one whistle. After cooking, dry up the extra water, if any but retain a little moisture. Now add bread pieces, mashed potato, garam masala, lime juice or vinegar and chopped coriander to the cooked mince. Mix well and then grind to a fine paste. Transfer to a bowl. Adjust salt to taste. Add the egg and again mix well. Chill the mixture for about 15 mins. Shape the prepared mince paste into small cylindrical rolls like cocktail sausages or into patties or balls and then roll each croquette in rawa/semolina to coat evenly and place on a plate. Chill for another 15 mins. Shallow fry in a pan until lightly brown and crisp or deep fry the croquettes till golden. Drain and transfer on to a platter lined with absorbent paper. Serve hot with your favorite sauce/ketchup/chutney or dip. To add more nutritive value, you can add vegetables like carrots and capsicum while cooking the mince. You can dip the prepared balls into lightly beaten egg before coating/rolling in rawa or bread crumbs. Uncooked croquettes may be frozen to use at a later date. Adding dry bread pieces helps to absorb excess water, if any. If the mince has dried up or has less moisture then soak bread lightly in water, squeeze out the excess water and add to the mince before grinding to a paste.